Every day, Watch This offers staff recommendations inspired by a new movie coming out that week. This week: Twilight: Breaking Dawn – Part 2 has us thinking of vampire alternatives. Since the early ’80s, popular Japanese author Hideyuki Kikuchi has been churning out horror-adventure novels in his Vampire Hunter D series—more than two dozen of them to date. They center on a half-human, half-vampire, all-unstoppable bounty hunter named D, who kills his way through the ridiculously dangerous, target-rich future of 12,090 A.D. 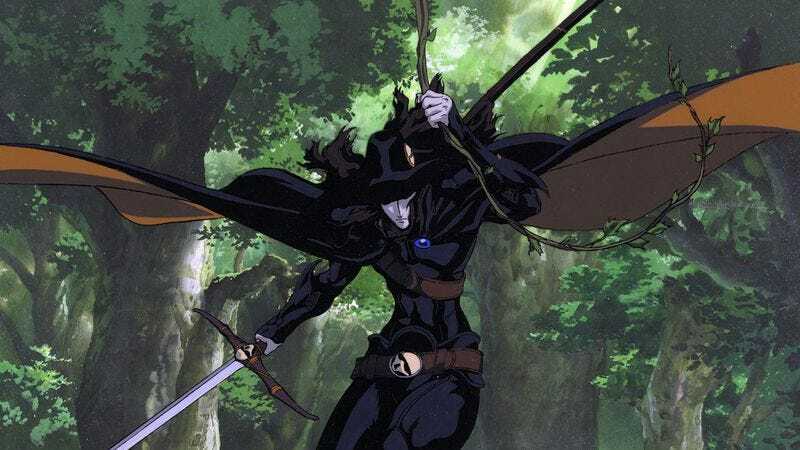 The 1985 animated film adaptation Vampire Hunter D was a high-water mark for anime of its era, but it looks terribly dated compared to the glistening, rococo goth-horror of the second film adaptation, 2000’s Vampire Hunter D: Bloodlust. Helmed by Animatrix contributor Yoshiaki Kawajiri, one of Japan’s most stylistically recognizable directors, Bloodlust adapts the third Vampire Hunter D novel, but the simple plot stands on its own without backgrounding. Kikuchi’s idea of vampires is old-school: They’re urbane, snooty aristocrats, until they need to be horrific monsters either to make a point, or to fight for survival. Bloodlust features a particularly effete bloodsucker who kidnaps a beautiful young woman, prompting her family to hire D to bring her back or kill her if she’s been tainted by undeath. But when D tracks them down, he finds out that the situation isn’t what he expected, and that the real threat comes from another quarter. Like some of Kawajiri’s previous book-to-film adaptations, particularly Ninja Scroll and the TV series X, Bloodlust is essentially a series of dynamic, beautifully rendered confrontations and pitched battles with a great deal of melodrama in between. It’s lushly rendered, almost laughably intense, and more than slightly cheesy, but for animation fans, it’s still a strikingly beautiful film, and an impressive thriller for those who prefer their angsty immortals to be capable of instigating major, messy bloodbaths. Availability: The DVD is out of print—the American distributing company has silently disappeared from the web—but the film is available through Amazon Video and appears in its entirety on YouTube.